I have a potter’s thumb. The middle joint can bendbackwards towards the palm of my hand. It looks weird and is a handy trick. Right now I’m being called Betta, which I enjoy. It’s Italian for Elizabeth. I try to be original, story-based, Australian, funny and poetic. Pipi Longstocking because she is in control of her own life and has a monkey and a horse. Fifty years in the future I could, hopefully, still relate to where I find myself, and would see how the lives of those I know unfolded and how the world has changed. I hope it would be a happy experience. I think we are a conglomeration of influences, so I’ll say: my parents, AA Milne, my husband and his mob, Enid Blyton, May Gibbs, the Beatles, my siblings, Astrid Lindgren, my first publisher, Rosalind Price, Walt Disney, my current publisher Sue Flockhart, Ronald Searle, our kids, the thousands of films I’ve seen, Bill McKibbin, Charles Dickens, my friends, Carson McCullers, to name a few. I started writing when I learned you could make marks and from them other people could know your thoughts, and you could know other people’s thoughts. It was intriguing. My current favourite is ‘door’ in Dutch, which means ‘through’ so ‘through the door’ is ‘door de deur’, and Hip hip hooray! is Hipidihip! Funny eh? Poems for the Millennium. The University of California Book of Modern and Post Modern Poetry. It’s thick and has poems for every person, every mood, every season, and it’s the most dip-into-able anthology that fires my imagination every time. 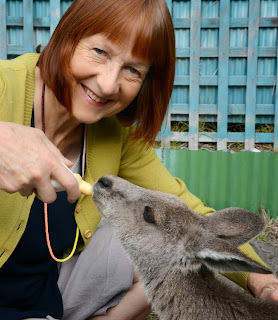 Elizabeth Honey is an award-winning Australian author of poetry, picture books and novels. 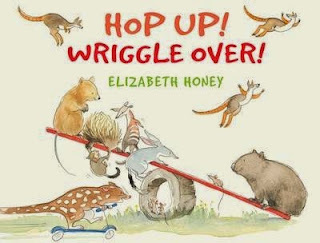 Elizabeth has written and illustrated her latest picture book, Hop Up! Wriggle Over!, which is published by Allen & Unwin. Visit Elizabeth's website and Facebook page for more information.